In the last eight articles we have charted some vast new territory, so it is time again to look back and gain some perspective on where we have been. Revisiting these articles will help you re-explore the territories where we have been, and see also how they fit together. These selections also correspond to the primary eight categories covered in the series, so this review provides an overview of one trip around the wheel, and also reflects the amazing range of topics possible to address with the Mandala Chart. If the Mandala Chart were seen in 3D, it might resemble at Rubik’s Cube. The resemblance goes beyond the visual similarity, and extends to the lessons of flexible focus, which is fast moving, physical, multi-dimensional, and fun! We have also seen how in our search for solutions, we move from the logical to the artistic, as has been the experience of many of the great scientists, entrepreneurs, and inventors. Einstein reminded us that, “We cannot solve problems by using the same kind of thinking we used when we created them.” Real solutions come in a Quantum Leap. Although hindsight is 20/20, it is remarkable how far off the experts of any given area were when it came to predicting the future. They were, and we are also conditioned to the see the future as an extension of the present and past that we know. Flexible focus gives you a new perspective, one that recognizes with Heraclitus (ca. 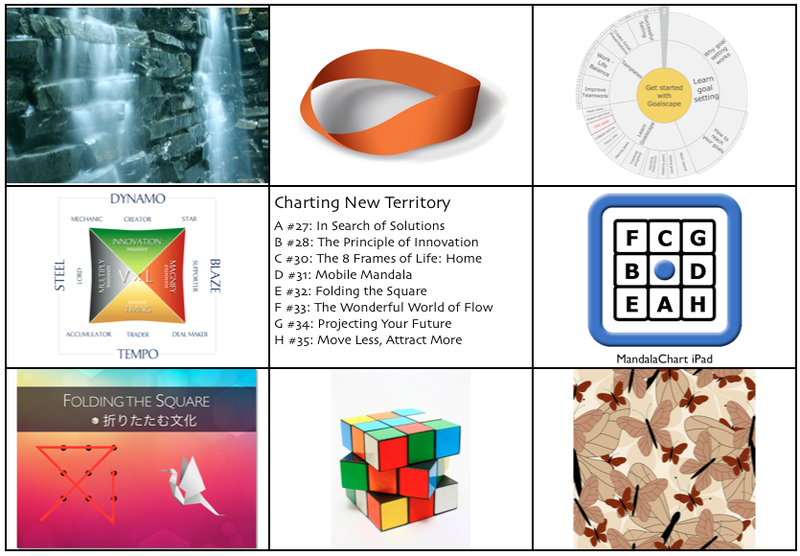 500 BC) that, “Hidden connections are stronger than obvious ones.” We learn to look inside and outside of the box using the Mandala Chart, and find much to learn about the process of innovation through the Wealth Dynamics Square, which is also framed like a Mandala Chart. Most importantly, we learn to innovate by emulating the Masters of Innovation, such as Steve Jobs and other Creators. We looked at home through the metaphor of the Möbius Strip, a single seamless loop that remains so even when you cut it in half. This is the source of the recycling symbol recognized worldwide, and it shows how we are, or should be connected in a self-sustaining and energy gaining system. This is a challenge is our era of dysfunctional families and broken homes, but at the same time we live in an era in which there are new kinds of families, and new ways of seeing how we are all connected. The key to this insight lies in the hippocampus, or seahorse of the brain, which helps us feel at home in the universe when it is active, or puts us in isolation and despair when it is idle. The message to remember is that we are family. We saw how flexible focus is a physical process, one in which you engage actively in the 8 fields of life, take action on your thoughts, present or write about your thoughts, and use idea capture software and tools. In this article we introduced the MandalaChart for iPad App, which is now available in the iTunes App Store, and we are releasing a series of templates, including one which I co-created called the Nanba Diary, which is available in the Contents Shop at MK-International. The seeds of your ideas may be mental or intuitive in origin, but their implementation is very much a physical process. This and other tools discussed in the article will make the task of implementation far easier. Outside the box…or inside the square? As shown by the traditional nine dots problem, illustrating the way of creativity as learning to think outside the box, the Japanese art of Origami, or paper folding, shows a remarkably innovative way of thinking inside the box by folding the square into an astonishing variety of distinct shapes, animals, geometric figures, and objects of all sorts. The lessons from this are contained in the Mandala Chart I created for this article, and explored in depth in a paper which I presented for the international conference of the Japan Creativity Society, which you can download at Folding the Square: The Geometry of Japanese Creativity. One of the greatest lessons you can learn from Japanese culture is the unity of discipline and spontaneity, which is at the heart of all of the Zen arts. Mihaly Csikszentmihalyi drew the world’s attention to an ancient phenomenon which is at that core of what makes life worth living, the state of being in Flow. This article looks at what the Flow state is, what benefits it has, how you enter it and maintain it. The Mandala Chart can also help you enter the Flow State, as can Deep Practice, which helps you: polish your skills, gain unconscious competence, discover new territory, develop skillful means, cultivate perseverance, gain perspective, guide or teach others, as well as get into the Flow state. In this article we looked at a circular Mandala software called Goalscape, which enables you to gain flexible focus in similar ways to the Mandala Chart, but adds the dimension of project management through progress and priorities, in a very attractive visual format. When resources in life are limited, you get the best results by focusing on the big picture with flexibility. The advantage of working with the Mandala Chart is that it puts your situation into a frame or context, while allowing you to shift perspective from the big picture to the small detail, without losing sight of the relationships. I call this integrate with eight. We also looked at how this approach can free you from the Tyranny of a To Do List, and has more flexibility than a calendar based Gantt Chart. Now is the time to step off the spinning wheel, drop out of the rat race, and gain the perspective to make this your best year yet. The abundance mentality is not just rose colored optimism, but in fact a highly practical way of solving shared problems by working together. This simple secret is missed or grasped on the strength of whether your mindset is one of giving in the grace of abundance, or one of taking on the assumption of scarcity. It is also the realization that you are not stuck with what you start with. One way to do this is to shift your emphasis from that of consumer to creator, and to find many ways to add value in business. The Mandala Chart can help you cultivate this attitude as well as put it into practice. Previous post: Social Media and Tribes #26: Social Media in 2011. Are you still in the GAME?